updates should expect Microsoft's update pricing to double each year. However, Microsoft has briefed some of its partners and salespeople about the cost of these Extended Support Updates (ESUs). And, as you'd expect, they're not cheap, especially for customers who may want to apply them on multiple PCs. They're even more expensive for customers using the Pro version of Windows than the Enterprise one. Last Fall, Microsoft officials said they would provide Windows 7 Extended Security Updates for three years, meaning through January 2023. These will be security patches/fixes like the ones Microsoft is currently providing for free for Windows 7 users, as Windows 7 is still in "Extended" Support through January 14, 2020. For Windows 10 Enterprise and Microsoft 365 customers, Microsoft will provide Windows 7 ESUs as an "add-on," according to information Microsoft seemingly shared with partners and salespeople. Year one (January 2020 to 2021), that add-on will cost $25 per device for that set of users. Year two (January 2021 to 2022) that price goes up to $50 per device. And Year three (January 2022 to January 2023) it goes up to $100 per device. To qualify for this pricing tier, customers can be running Pro as long as they are considered "active customers" of Windows Enterprise in volume licensing. For users who decide to stick with Windows 10 Pro rather than Windows 10 Enterprise, those ESU prices are significantly higher. Year one, Windows 7 ESUs will cost those Windows 7 Pro customers $50 per device; Year 2, $100 per device; and Year 3, $200 per device, according to information Microsoft seemingly shared with its partners and field sales people. I asked Microsoft officials if they'd verify this pricing information. I also asked if there would be volume discounts on these prices available to customers with a large volume of Windows 7 devices needed ESUs, which I'm thinking could be the case. No word back so far. 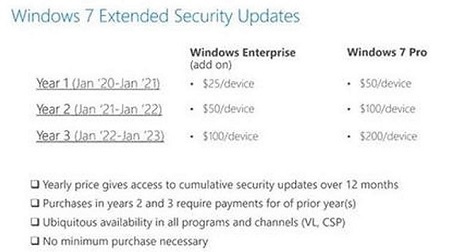 These prices ensure customers they will receive cumulative security updates for Windows 7 over the course of a year. If customers decide to purchase ESUs in Year 2 or 3, they will need to pay for prior years. There's no minimum purchase required, according to the documentation I've seen (and a piece of which I've embedded in this post, above). Microsoft has offered extended security updates in the past for no-longer-supported versions of Windows via Custom Support Agreements costing millions of dollars. "Customers would need to work with their Microsoft account team for details on pricing," which, again, makes me think that these listed ESU prices are possibly negotiable based on volume.